Misapplication of Fiduciary Property—What is it? Misapplication of fiduciary property is a charge that is aimed at protecting beneficiaries of trusts, estates, receiverships and the like. 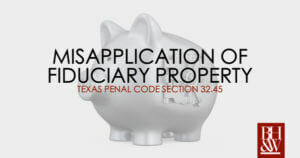 Pursuant to Section 32.45 of the Texas Penal Code, a person commits the offense of misapplication of fiduciary property by intentionally, knowingly, or recklessly misapplying property he holds as a fiduciary in a manner that involves substantial risk of loss to the owner of the property. Tex. Penal Code Ann. § 32.45(b). “Substantial risk of loss” means a real possibility of loss. Casillas v. State, 733 S.W.2d 158, 163¬–64 (Tex. Crim. App. 1986). However, the possibility need not rise to the level of a substantial certainty (which is required for theft)—the risk of loss need only be more likely than not. Id. Who is a “Fiduciary” Under Texas Law? Any other person acting in a fiduciary capacity. “Acting in a fiduciary capacity” is not defined in the penal code. However, the Texas Court of Criminal Appeals determined that because “fiduciary” has such a common meaning it should be construed according to its plain meaning. Berry v. State, 424 S.W.3d 579 (Tex. Crim. App. 2014). The plain meaning of fiduciary means, “holding, held, or founded in trust or confidence.” More notably, a person who acts as a fiduciary is one “who has a duty, created by his own undertaking, to act primarily for another person’s benefit in matters connected with such undertaking.” Gonzalez v. State, 954 S.W.2d 98, 103 (Tex. App.—San Antonio 1997, no pet.). For example, courts have held that a person acts in a fiduciary capacity “when the business which he transacts, or the money or property which he handles, is not his or for his own benefit, but for the benefit of another person as to whom he stands in a relation implying and necessitating great confidence and trust on the one part and a high degree of good faith on the other part.” Gonzalez v. State, 954 S.W.2d 98, 103 (Tex. App.—San Antonio 1997, no writ). Additionally, a person acting in a fiduciary capacity embraces any fiduciary, including a joint adventurer or partner. Coplin v. State, 585 S.W.2d 734 (Tex. Crim. App. 1979). This does not, however, include everyday business dealings. Berry, 424 S.W.3d at 584. The Court of Criminal appeals assume such transactions are entered into for a mutual benefit and, therefore, neither party is expected to act solely for the benefit of the other. Id. What does it mean to “Misapply” Property? A law prescribing the custody or disposition of the property. Evidence that a defendant aided another person in misapplying property is sufficient, pursuant to the law of parties, to convict a defendant of misapplication of fiduciary property—even if the defendant did not personally handle the misapplied funds. Head v. State, 299 S.W.3d 414 (Tex. App.—Houston [14th Dist.] 2009, pet. ref’d). Furthermore, a defendant need not receive a benefit in order to misapply property. Talamantez v. State, 790 S.W.2d 33,37 (Tex. App.—San Antonio 1990, pet. Ref’d). Nor does it matter if a defendant donated the property to charity. Little v. State, 699 S.W.2d 316, 318 (Tex. App.—San Antonio 1985, no pet.). Therefore, misapplication can occur by an omission or failure to act where a duty to act exists. Coleman v. State, 131 S.W.3d 303, 309-10 (Tex. App.—Corpus Christi 2004, pet. ref’d). What does it take to Prove up an Agreement? The government must prove the defendant knew of the agreement for misapplication to occur. Amaya v. State, 733 S.W.2d 168 (Tex. Crim. App. 1986). But, similar to “fiduciary,” Section 32.45 does not define “agreement.” Thus, the Court of Criminal Appeals construes agreement according to its plain meaning. Bynum v. State, 711 S.W.2d 321, 323 (Tex. App.—Amarillo 1986), aff’d, 767 S.W.2d 769 (Tex. Crim. App. 1989). To prove up an agreement, the State must be able to demonstrate a harmonious understanding or an arrangement, between two or more parties, as to a course of action. Id. Additionally, there is nothing in Section 32.45 that requires the agreement to be in writing or proved directly. Id. An effective defense to a charge of misapplication of fiduciary property is mistake of fact—otherwise negating the culpability required for the commission of the offense. Section 32.45 is designed to punish intentional, knowing or reckless misapplication of property. Thus, if it can be proved that the improper use or application of the property was the result of mere negligence, by mistake of fact, the statute will not apply. Other defense vary depending on the facts of the case. Felony of the first degree if the value of the property misapplied is $300,000 or more. Moreover, there is also an additional enhancement (to the next higher category) if it can be shown that the beneficiary was a person 65 years or older. § 32.45(d). When Does Misapplication of Fiduciary Property Usually Occur? When an attorney misapplies a client’s funds. These examples demonstrate that Section 32.45 covers many situations and may result in serious consequences. Thus, if you are under investigation or have been charged with the offense of misapplication of fiduciary property, it is necessary you seek help. Our criminal defense team handles Misapplication of Fiduciary Property cases in Tarrant County, Texas and surrounding areas. If you are under investigation for w financial crime or white collar offense, contact our firm today for a free case evaluation. How Far Does the Trial Courts Discretion Go in Determining Whether to Hold a Pretrial Evidentiary Hearing? 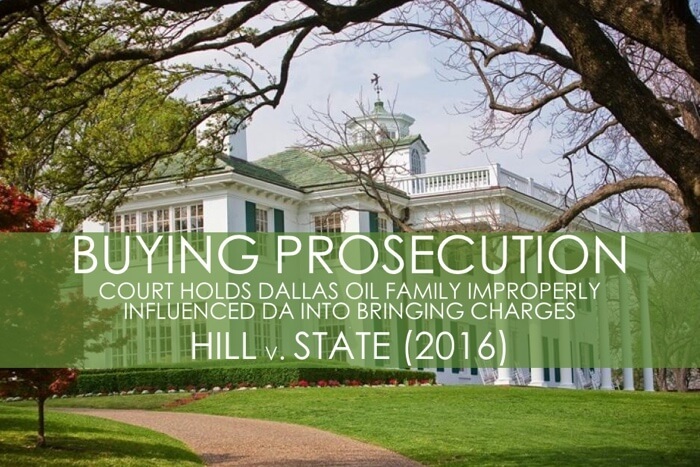 Appellant Hill is the great-grandson of legendary Dallas oil billionaire H.L. Hunt and the events surrounding the indictment dealt with a multi-million dollar trust litigation between Hill and his father. Hill and his wife Erin were indicted in 2011 for making false and misleading statements in order to obtain a $500,000 mortgage from Omni American Bank. The indictment came shortly after Hill won in the trust litigation against his father. 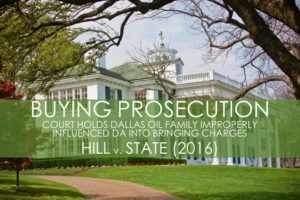 Prior to the indictment (but after Albert Hill’s victory in the trust litigation) Hill’s father’s attorney, Michael Lynn delivered a memo to the Dallas County District Attorney’s Office which alleged various offenses committed by Hill and his wife. Hill challenged these charges by filing a motion to quash the indictment and a motion to dismiss. Hill argued that the District Attorney, Craig Watkins, was under the influence of his disgruntled father as well as Lisa Blue Baron, one of Hill’s attorneys in the trust litigation case that had just filed a lawsuit against Hill seeking several million dollars in legal fees. Lisa Blue Baron also held a fundraising event for Watkins’ campaign at her house and made a $5,000 donation to the campaign. The trial court held an evidentiary hearing on Hill’s motions and granted both the motion to quash and the motion to dismiss. The Fifth Court of Appeals reversed the trial court’s dismissals holding that the trial court “erred in conducting a hearing on Hill’s motion to dismiss.” The State argued that the trial court should not have held a pretrial evidentiary hearing because Hill failed to prove, with evidence, a prima facie case of prosecutorial misconduct and vindictiveness. The Court of Appeals stated that before a pretrial evidentiary can be held for a defendant claiming a violation of his constitutional rights, the defendant must “present facts sufficient to create a reasonable doubt about the constitutionality of his prosecution.” The Court of Appeals found that Hill did not sufficiently meet this standard. 1. Article 28.01 – The CCA points to Article 28.01 in determining that the trial court had the discretion to hold a pretrial hearing on Hill’s motions to quash and suppress. Article 28.01 §1 provides that a trial court “may set any criminal case for a pre-trial hearing” and that some of things that the pre-trial hearing shall be to determine is the “pleadings of the defendant,’ ‘exceptions to the form or substance of the indictment,’ or discovery.’” Article 28.01 §1(1), (2), (4), (8). Additionally, while Article 28.01 does not expressly provide for an evidentiary hearing on a motion to dismiss like it does for a motion to suppress, the Court determined that it would be a misapplication of the rules of statutory construction to decide that oral testimony cannot be used in a pretrial hearing to resolve any other issue raised. The State pointed to federal case law that provided defendant must make a prima facie case that raised a reasonable doubt. However, these cases dealt with the issue of whether the trial court erred by denying a pretrial hearing. Thus, the Court stated that this case law is not on point in Hill’s case and thus are not controlling on this issue, and do not persuade the Court to hold otherwise. The CCA determined that Article 28.01 has no limiting factor on the judge’s discretion to hold a pretrial evidentiary hearing based on any threshold evidentiary standard. Accordingly, the trial court did not err in conducting the pretrial evidentiary hearing in Hill’s case but instead acted within its bounds of sound discretion.